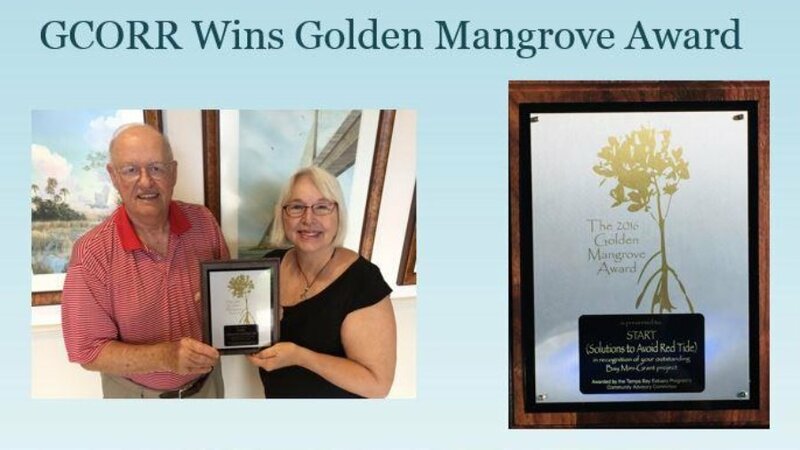 START is very pleased to announce that our Gulf Coast Oyster Recycle and Renewal Program (GCORR) has been awarded the Golden Mangrove Award by the Tampa Bay Estuary Program. The award is given to the grant recipient who has made the most effective use of the funding by leveraging it among other partners and programs to achieve a measurable outcome. Joining START as partners in the GCORR program are the Chiles Group of restaurants (The Beach House, Mar Vista and The Sandbar), the Manatee County Parks and Recreation Department, the Gulf Shell Fish Institute and the Florida IFAS Program. The GCORR program saves used oyster shells from the participating restaurants to create the necessary substrata to form new oyster reefs at Robinson’s Preserve in Bradenton. This process keeps the oyster shell out of our landfills, eliminates the cost and environmental damage of digging up fossil oyster shell that is usually used to create new oyster reefs and has produced 23% more new juvenile oysters than the fossil shell. In the past year, the GCORR program has accumulated over 26 tons of shell for use in creating new oyster reefs. Shown above receiving the award for START from left to right are Sandy Gilbert, Chairman/CEO and Mary Anne Bowie, Project Manager.